Our Blog | Samuel Ibrahim, Jr.
Hydroforming is a specialized type of die forming that uses high-pressure fluids to form ductile metals such as stainless steel, carbon steel, copper, or aluminum into a particular shape. 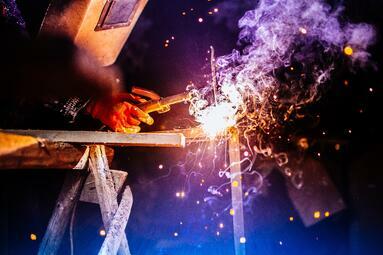 The process involves first placing a sheet of metal over a predesigned molding tool. The tool can be a mechanically driven mandrel or a solid female die. A hydraulic fluid (either oil or water) is then pumped into a chamber behind a flexible, high-strength rubber diaphragm at high pressures. 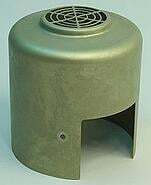 The pressure of the liquid on the rubber diaphragm either counters the force of the rising mandrel for deep drawing applications, or can force the metal into the female mold to produce relatively flat convex and concave shapes. Hydroforming is capable of producing intricate shapes that would be otherwise impossible or unfeasible with progressive die stamping. This technique can also produce metal components with a high strength-to-weight ratio, at a faster rate, and at a lower per-unit cost than conventional metal stamping. Hydroforming uses a single form surface tooling which can be either male or female. The use of a solitary rigid tool reduces the overall time and costs associated with the design and manufacture of the mold. The force used to shape the steel is derived from water, which is a widely available resource and has negligible cost implications. 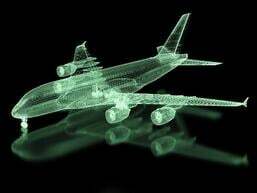 Additionally, since only a single tooling is required, design changes to the mold can be incorporated within a few days without significant impact to the manufacturing cost or schedule. 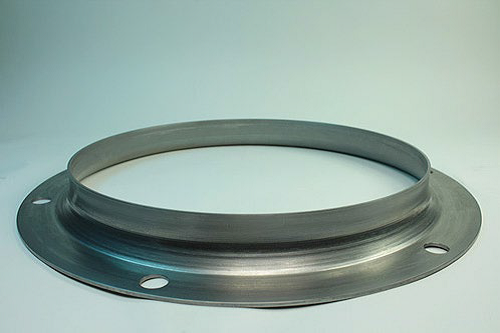 As the rubber diaphragm is filled with pressurized liquid, it presses against the metal sheet, causing the compressive forces to distribute evenly and consistently across the surface of the metal, thus improving formability and appearance. The additional distribution of strain across the metal section increases strain hardening and, therefore, produces a product with enhanced strength properties. The increased strength obtained from hydroforming also has the added benefit of significantly reducing spring back, especially in closed sections such as tubes. During tube hydroforming, the material can be precut to the desired dimensions before being sent to the hydraulic press. As a result, the part is formed with little to no wastage (usually 0-10%). Moreover, the ability to precut and preform the metal into desired shapes means that complex profiles can be made with a high degree of repeatable accuracy, within strict industry tolerances. The reduction in secondary operations such as cutting and welding means less handling, less machinery, and reduced cost. Metal stamping, though useful for a broad array of applications, has several disadvantages when compared to hydroforming. 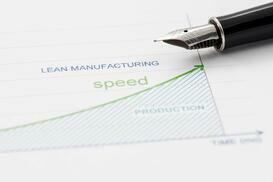 Upfront tooling costs can make short production runs expensive, ineffective, and unfeasible overall. 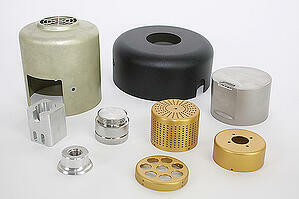 The tooling in metal stamping consists of a male (core) half and a female (cavity) half. The time and cost to produce both halves of the tooling can lead to increased manufacturing costs and longer lead times since more time is needed to design and develop the tooling. Metal stamping also generally requires that the metal sheet overlap the stamping die by a specified amount to allow the die to punch through and form the material. This process can result in material wastage of 20% or more, depending on the application. Although metal stamping still certainly has its place in the manufacturing industry, hydroforming far surpasses this traditional forming method in numerous areas. If you would like to learn more about hydroforming services from Helander Metal and how they can benefit your application, feel free to contact our technical team. The team at Helander is thrilled to announce that we will be attending the 2018 Greater Chicago Design-2-Part trade show from Wednesday, May 9 to Thursday, May 10 at the Schaumburg Convention Center in Schaumburg, Ill.
Held regularly for over 40 years, the Design-2-Part Show is the largest trade show for design and contract manufacturers in the United States, bringing together leading engineers and product manufacturers as they search for the best suppliers of custom components and contract manufacturing services. Attendees will be able to seek out high-quality suppliers while exploring the newest technologies and innovations for solving common manufacturing challenges. Anyone looking to reduce manufacturing costs, find better-quality products, and ensure faster delivery times can expect to meet face-to-face with many potential partners, including those who offer full-service design, prototyping, and custom manufacturing capabilities. Helander is proud to be exhibiting at the Greater Chicago Design-2-Part Show, where we’ll be highlighting our expertise in precision metal components such as metal hemispheres and metal cones, airflow nozzles, pressure vessel shells, tank heads, and magnetic and rotary pumps. Select parts and components will be on hand for attendees to view. Our team will also showcase our wide-ranging custom manufacturing services, including metal spinning, sheet hydroforming, CNC machining, tooling design, and welding. Attendees will be able to explore options for their specific applications, and our expert team will be hand to answer any questions. 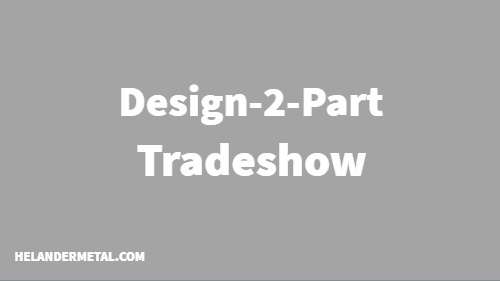 Allowing job shops and manufacturers to connect directly with OEM engineers, managers, and buyers, this year’s Design-2-Part Show will offer many valuable networking opportunities — plus the chance to view the latest, most cutting-edge innovations. Ready to learn more about the upcoming 2018 trade show, or looking to discuss Helander’s custom precision metal manufacturing services? Reach out to the team directly. Looking to join us at this year’s event? Register for free today! As manufacturing automation continues to rise in popularity, metal processing services are more reliable and affordable than ever. In fact, many companies across the industry, including Helander, are beginning to incorporate automated controllers and machine learning systems into their manufacturing facilities. This equipment allows us to quickly and easily complete key tasks, such as monitoring and adjusting pressure, temperature, and other elements during critical metal processing activities. This results in greater accuracy and precision, ensuring superior reliability. Plus, since processing errors are no longer a risk, no time is wasted remedying mistakes or recalibrating — ultimately saving money and time for our customers, as well. Helander is starting off strong in 2018, with the recent addition of some new cutting-edge automation equipment. This sophisticated machinery allows us to offer three new services for our clients: automatic welding, CNC spinning, and automatic polishing. Automated seam welding is unique in that it applies the MIG (metal inert gas) welding process in a precise, automated setting in order to create full-penetration seams. Automatic welding can be done for a wide range of common materials, including aluminum, carbon steel, and stainless steel. The process creates airtight joints very quickly, allowing for quicker, streamlined production. 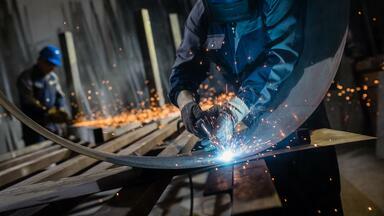 This welding process offers many other advantages, as well. First, it’s airtight, and provides a high level of accuracy, ensuring that the weld is both reliable and precise. It’s also very versatile, and can be used to manufacture both single-seam and parallel-seam welds for cones, boxes, and flat sheets. And since automatic welding can be performed at high speeds, we can complete large runs with very quick turnarounds to fulfill customers’ exact needs. 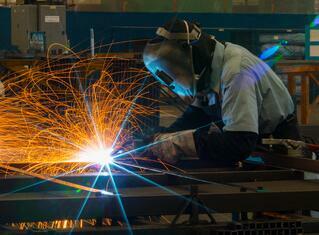 This type of automated welding is ideal for roll-formed, strip, and flat sheet metals. Helander can employ automated seam welding for several different types of metal, including stainless steel, aluminum, steel, copper, Inconel®, titanium, and brass. Automated seal welding is ideal for joining both similar and dissimilar metals. Computer numerical control (CNC) spinning is a metal spinning process often used for high-quantity production runs. In these applications, CNC spinning allows for better consistency than traditional processes, such as hand spinning. And because the CNC method makes use of a mechanized motor, it can be used for materials that are less malleable and more difficult to spin. CNC spinning can be employed for a wide range of metals — including copper, brass, stainless steel, carbon steel aluminum, and titanium — to produce welds for various industries, including the decorative, architectural, medical, and aerospace sectors. 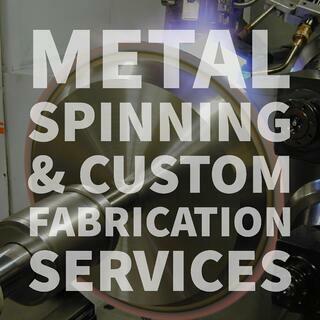 Allowing for high-volume runs with great precision, CNC spinning offers numerous benefits. First, the use of an automated machine ensures higher accuracy, as success isn’t dependent on operator accuracy. Through sophisticated programming, we’re able to ensure that the spinning motion is correct and completely repeatable throughout the entire run. In fact, because the work envelope of the spinning lathes is so consistent, we can program our CNC spinning machines to create thousands of copies — that are more or less identical — from just a single form. CNC can produce a wide range of shapes including bell-shaped, spherical, and tubular forms, which we can design and manufacture very quickly. CNC spinners also have very short lead times, meaning we can easily switch to new jobs after completing a run; all we have to do is change the form and program. In addition, CNC spinners can operate continuously, 24 hours a day, 7 days a week. And since CNC spinning allows for rapid production rates, it’s very effective for prototype creation — especially compared to traditional machining methods, such as stamping. Not only are CNC spinners very time-effective, they’re also much more cost-efficient than many other machining processes. These cost savings are a direct result of the shorter lead times and highly effective use of materials; CNC spinners produce minimal waste and have very low upfront tooling costs, especially compared to those of deep drawn stamping or metal pressing processes. Automatic polishing utilizes programmed robots to complete critical surface finishing tasks. Our automatic polishing systems can provide a range of different finish options, and we make frequent use of automatic polishing, in particular, for various applications — including assemblies, decorative items, recreational products, and threads. Whether clients require a rough or fine finish, automatic polishing can be done on almost any metal, including stainless steel, steel, copper, brass, bronze, and aluminum. As with automatic welding and CNC spinning, automatic polishing offers several unique benefits, including major cost and time savings for our customers. Because our automated polishing systems reduce the need for manual labor, clients save significantly on labor costs. Plus, automatic polishing can be completed in half the time as manual polishing — putting finished products into clients’ hands much more quickly. For over 80 years, Helander has been producing high-quality metal products for customers across a wide range of industries, and we’re thrilled to introduce these new capabilities to our line of metal services. 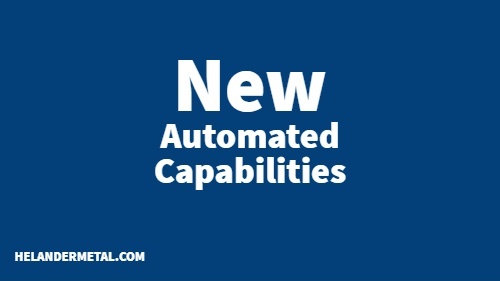 To learn more about our new automated services and discuss how they can help with your unique application, reach out to the team today. Helander is thrilled to announce that we’ll be exhibiting in booth 50 at this year’s American Manufacturing Summit (AMS). An annual gathering of leading industrial and manufacturing professionals, this exciting conference allows for the exchange of ideas regarding industrial operations optimization, innovative manufacturing practices, and supply chain management techniques. Various events and lectures will be held, and attendees will have the chance to network with top leaders while browsing new products, services, and innovations. This year’s event will be held March 27-28 at the Westin Lombard Yorktown Center in Lombard, Ill. The 2018 Summit will focus on the role of industry leaders in streamlining factory floor operations, supporting lean manufacturing, and automating production processes. Collaborative business models will also be explored, and attendees will hear from experts on how to increase profitability in today’s ever-shifting industrial landscape. All top influencers in the manufacturing industry have this conference circled on their calendars; offering unique insights into market trends, technological innovations, and best industry practices — as well as valuable networking opportunities — attending AMS is a must for those committed to staying ahead of the curve. One-to-one meetings will be included in this year’s lineup — allowing professionals to network and exchange ideas in a more personal setting — as well as a highly curated exhibition floor and a Marketing 365 initiative, helping companies extend their brand reach with content sharing, blog posts, and original content generation. Various educational lectures and seminars will be held, with specialized focus on today’s most important topics. Helander is proud to be among the exhibitors at this year’s American Manufacturing Summit. 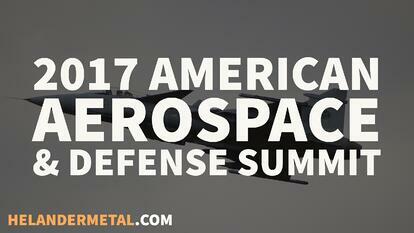 Our team will be presenting various precision metal components and highlighting our unique services. Whether attendees are in the market for satellite dishes, airflow nozzles, pressure vessel shells, or tank heads, we’ll have something to show them. Showcasing our metal-spun part capabilities, we’ll be highlighting our ability to work with a wide range of materials, such as sheet metal, tubing, plate stock, mild and stainless steel, hybrid alloys, copper, aluminum, and brass. Our metal stamping and spinning, sheet hydroforming, CNC machining, and hydroforming services will be clearly laid out for attendees, and team members will be on hand to answer questions and provide assistance as needed. At Helander, all of our services, from metal spinning to hydroforming, make use of the latest advancements in precision technology and adhere to the strictest environmental standards. Our products are found in a huge range of industries and applications, including automotive, aerospace, high-end furniture manufacturing, civil engineering, and food and beverage. To learn more about the upcoming American Manufacturing Summit or discuss Helander’s custom precision metal manufacturing services with an expert, reach out to our team. Want to join us at this exciting event? Register for free today or meet us in booth 50!